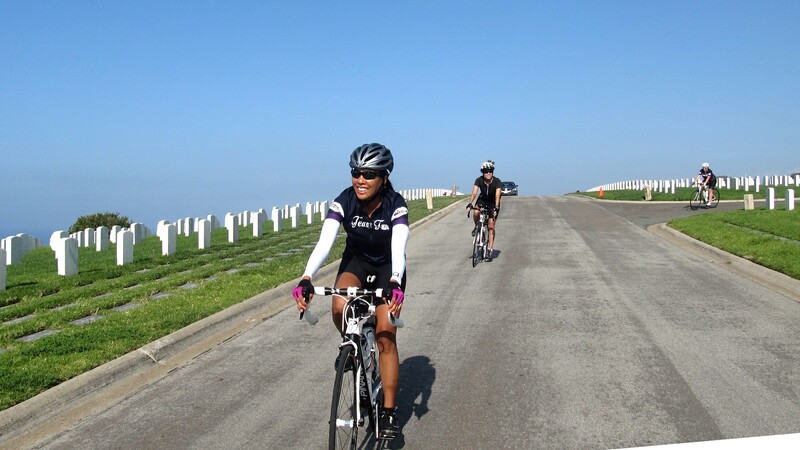 Cabrillo Mellow Sightseeing Ride… Really! B group was comprised of Michell, Jen, Janice and Kim Z. We took off last due to a bit of miscommunication, but were soon making our way south through UCSD, the partially flooded Rose Canyon path before making our first stop at De Anza Cove in Mission Bay (where next week’s ride will start from) to covort with the Oscar Mayer Wienermobile and its neighbor the Peanutwagon. The day was sunny and warm and we were feeling like a bunch of hot dogs! 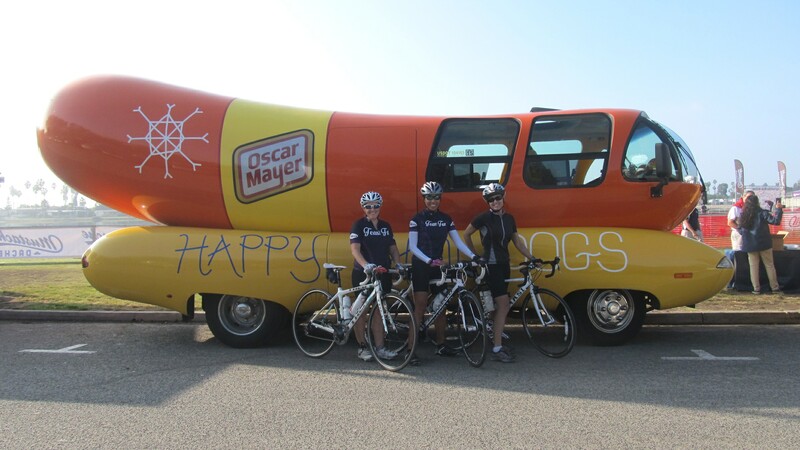 Hot dog-ing with the Wienermobile! Passing the impromptu rock garden along OB Bike Path. We had a nice run south to the river and took the OB bike path west, past a rather cool impromptu rock garden before veering into virtually every alley in Ocean Beach on our way to Sunset Cliffs Blvd and its always scenic open ocean view. Just as the lasses were feeling stoked about our scenic and flat ride, though, Michell had a hill-withdrawal and swung the group inland on a certain semi-steepie combination climb (Novara – Trieste – Santa Barbara) with an added short burner of a block on Lomaland Dr to give our small ring some love. 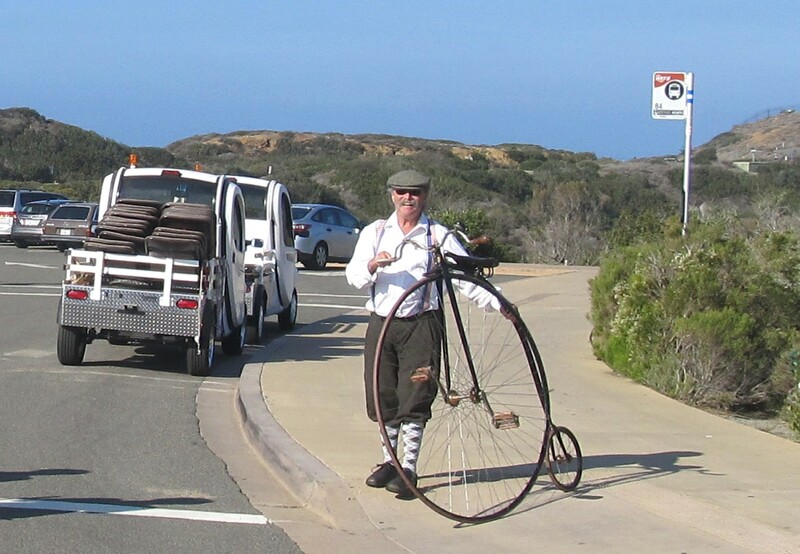 Still smiling our way along Sunset Cliffs Blvd. A hopping good time at the Greek Amphitheater. Lucky me, Pt Loma Nazarene University has a lot of sights worth climbing to see, so my partners in climb refrained from hurling me into the Pacific Ocean for the moment. 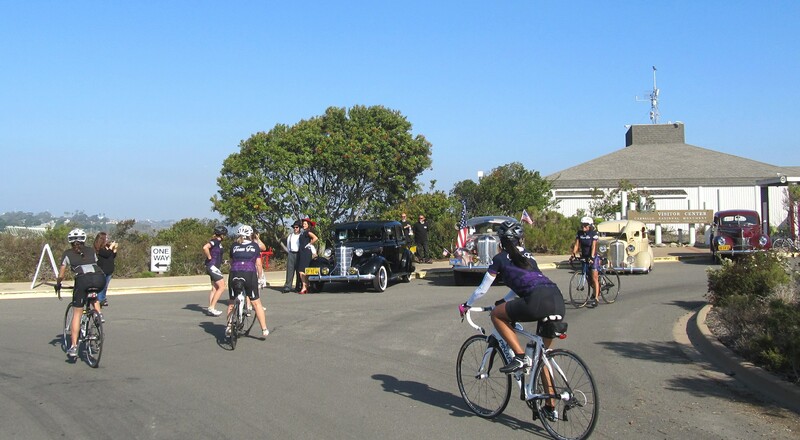 It got even better when we got to Cabrillo Park to find that they were commemorating the Pearl Harbor attack with volunteers walking around in period attires and autos. The WW II bunkers were open for viewing. We ran into A group there having a blast… wait for it… sight-seeing! Surrounded by cute WW II GIs at Cabrillo. Ran into A group sight-seeing Pearl Harbor commemoration at Cabrillo. 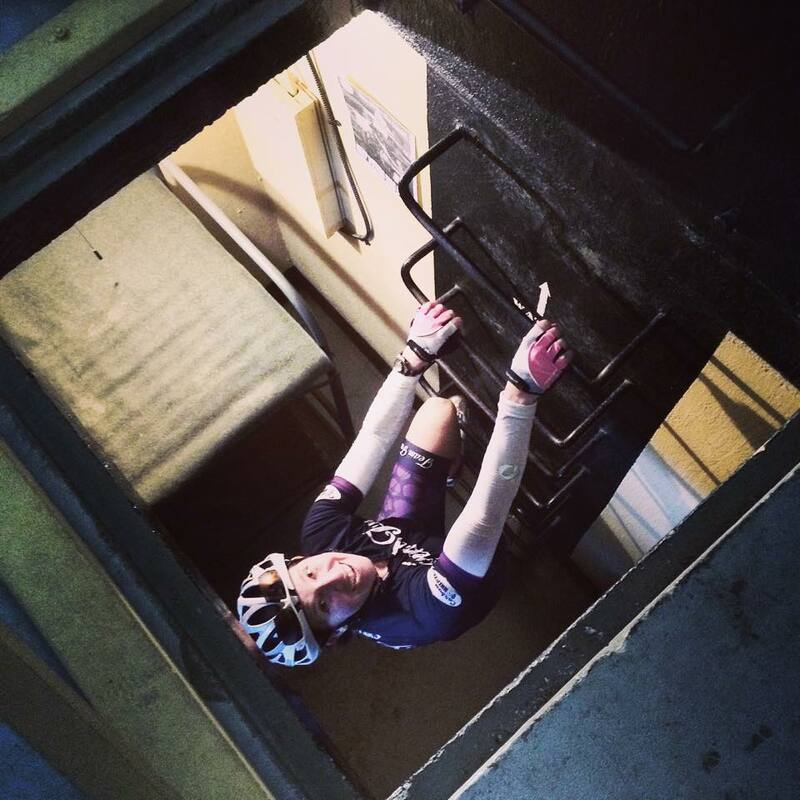 Heather K… is not claustrophobic… at all. 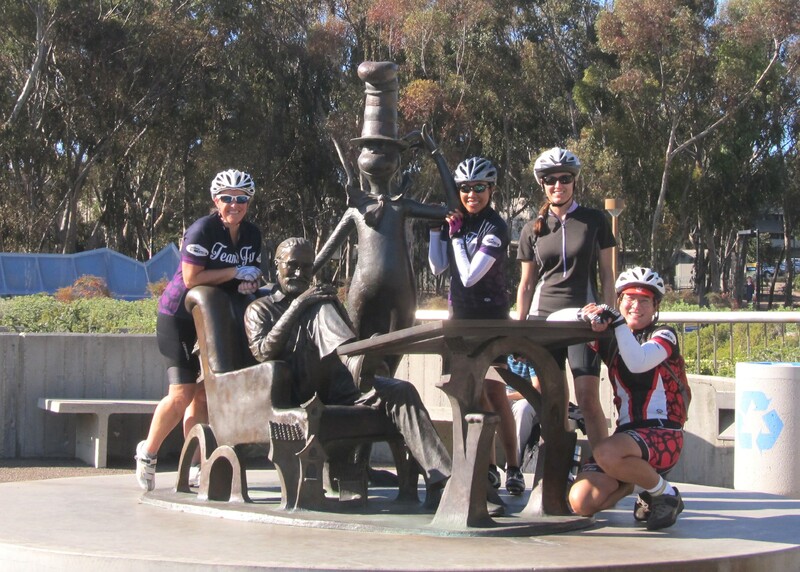 Ambushing Dr Seuss and the Cat in the Hat at UCSD. 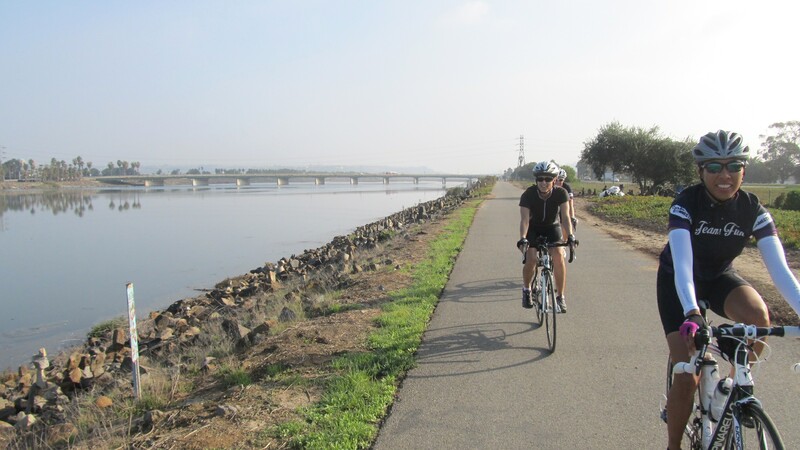 The original plan for the C group was to head out to Cabrillo, but from a much closer starting point in Mission Bay, limiting the ride to a flatter, shorter ride of 25 miles. The brave gals of the C group eschewed the shorter ride in favor of the full ride so we could start and end with everyone else – and experience the joys of the Gilman climb at the end of what was to be the longest ride for many of us (or, the longest ride in a while). Brielle, Miki, Laura, and Mary joined Heather for the morning. C group taking off from the Gliderport. The ride went swimmingly, and our group of five kept to a fairly tight knit line all the way down to Ocean Beach, where… Well, let’s just say I got a little turned around. Facing steep hill after steep hill as we headed out toward what I knew to be the general direction of Point Loma, I decided I better stop and check out a map before I take us up any steepies we might regret later. 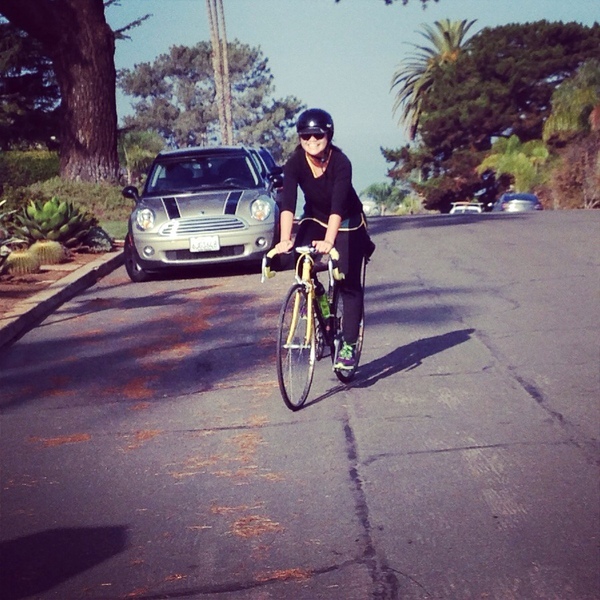 Mary, still smiling after riding up Santa Cruz St steepie on a standard crank. 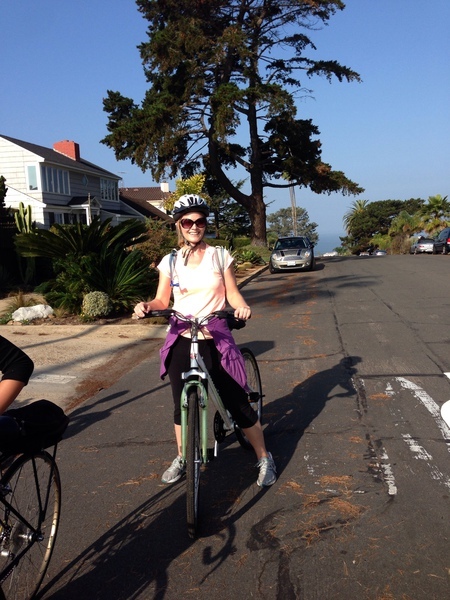 Miki & Laura thought Pt Loma seems to have shrunk a bit since their last ride. Brielle, still smiling after being told that hill-repeat isn’t in today’s menu. So we cruised around a bit, after I decided going up a hill was going to be a must, until we settled on giving Santa Cruz a try. It looked reasonable enough – from below. What we couldn’t see from that angle was how much worse it got near the top – about 8% average for almost .5 mile – not bad for the tough C group! And no one even tried to murder me at the top. I tried to claim I was just trying to imitate Michell – I don’t think they were buying it. I wasn’t making any further detours off the path to any place that might lead us to another unexpected steepie – we headed straight to our goal and ended up crossing paths with the A group at Cabrillo. We kept a steady pace for the remainder of the ride, in spite of the headwind and the seemingly endless low grade climb that awaits you for what feels like the last five miles or so. I was really looking forward to some pasta or a panini at Bella Vista Cafe, but no one was up for it this time – maybe next time! You know you’re hungry when all your thinking about is lunch for the last half hour of the ride. “Today was good. Today was fun. Tomorrow is another one!” – Dr Seuss, My Many Coloured Days. And if we draw a rainless next Saturday, it sure looks to be another fun one! 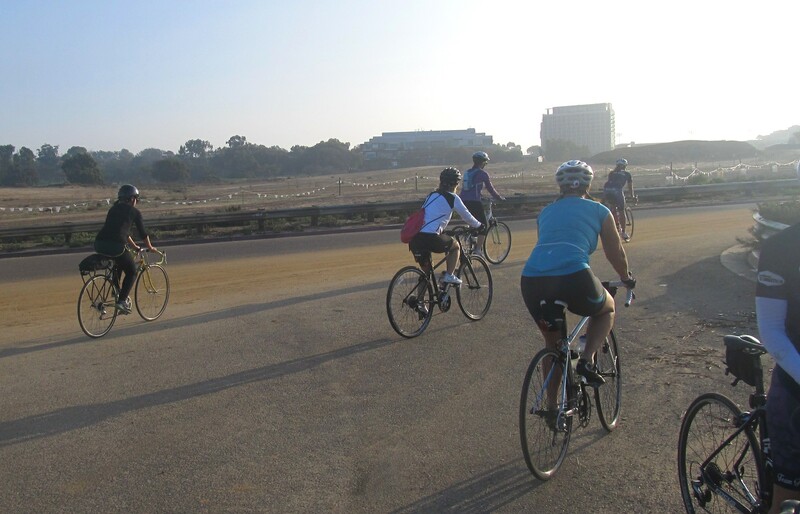 On Saturday December 13 Team Fun will be riding to Coronado Island from De Anza Cove on the north side of Mission Bay. 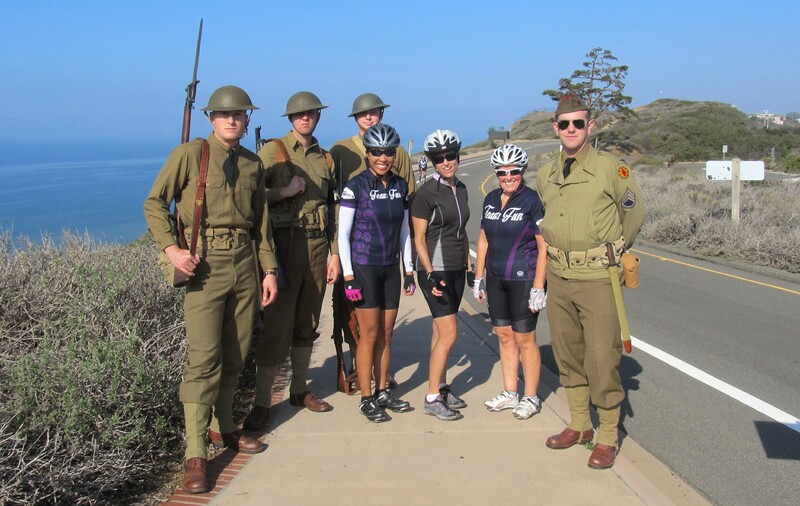 We are going to put on some miles, but they will be flat ones (unless you forget to stop following Michell after we get back to start point, in which case you may find yourselves putting on more not-so-flat miles up and down Mt Soledad). We are taking the ferry across on the way back, so remember to bring $4.25!